An alleged hitman, arrested for a bloodbath in which four people were killed and two injured in suspected taxi violence in Hout Bay, hobbled into the Wynberg Magistrate’s Court on Monday. He was barefoot, with his legs wrapped in bandages, after being shot in both limbs. Bandile Rotyi is understood to have been arrested at Groote Schuur Hospital after seeking medical attention for his injuries, believed to have been sustained in the early morning shooting two weeks ago. Grimacing as he set his crutches down next to him as he took a seat next to the dock, he appeared to be in pain throughout his short appearance before Magistrate Goolam Bawa. According to the State, Rotyi was identified by a witness as one of the shooters behind the violence which played out near the local police station on April 1 at about 06:40. Among the casualties in the shootout are another suspected hitman, a taxi owner and a driver. News24 understands that more arrests are expected. 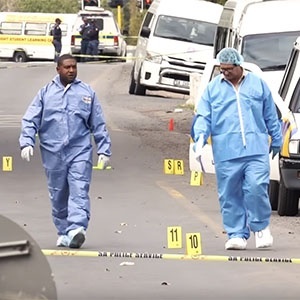 According to authorities, the violence was believed to be related to ongoing disputes between two associations affiliated with the Cape Amalgamated Taxi Association (Cata) and Cape Organisation for the Democratic Taxi Association (Codeta) - Cata Hout Bay and the Wynberg and Central Unity Taxi Association respectively. Illegal operations, resulting in sporadic clashes between the two associations, date back a few years. After the shooting, the Provincial Transport Registrar issued notices of suspension to both associations. Spokesperson for Transport and Public Works MEC Donald Grant, Siphesihle Dube, on Monday confirmed that the suspension was valid for six months and was yet to be lifted. Rotyi will be held in the prison hospital section ahead of his next court appearance on May 7 for a formal bail application.